I’m a bit of a follower of mid-twentieth century Central European novelists, particularly Czech and German, who manage to create multiple layers of meaning using very simple and often colloquial language. They confirm that you don’t need to fill a work with polysyllabic words to communicate deep ideas successfully. This book is a masterpiece of this kind of writing. 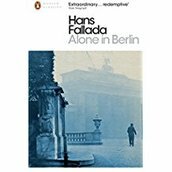 The novel is set in Berlin during the World War II and is based on the true story of Elise and Otto Hampel, a couple of ‘resistants’ against the Nazi regime. Their form of protest was to write hand-written postcards with anti-Nazi propaganda and leave them all over the city. Most of them were just handed into the police. The irony of this ineffective activity is the base from which the author builds a humorous but dark study of the human condition under the threatening and oppressive regime of the Third Reich. It is full of brilliant and amusing examples of how ordinary people excuse their lack of courage or their bad behaviour through a fragile veneer of self-deception. For those of us who have never experienced difficult or oppressive living conditions, the novel provides an insight into how people cope with them, not only physically but also mentally. I realise I may be giving the false impression that this is a harsh and serious novel. It is indeed black humour; but in this case, the humour trumps the blackness. Read it and laugh! But, after you’ve finished, you will be left reflecting on its dark messages.